Skyndeep is the graphic infusion of pigment into the polyester surface of the head, making it uniquely attractive while maintaining the integrity of a great sounding drumhead. Skyndeep is weather-resistant, produces warm tones, and increases sound volume and projection in any environment. 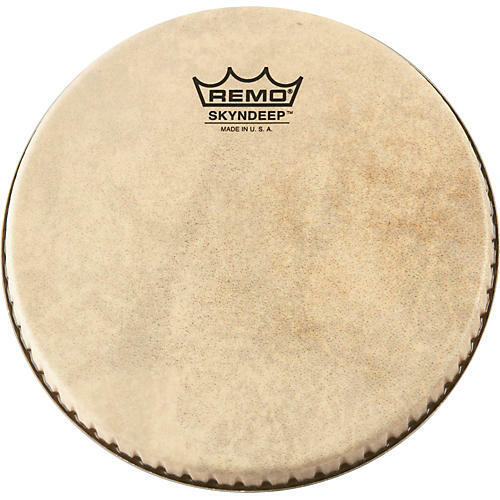 Traditionally, drums like the conga, bongos, and djembes have drum heads made with animal skins. These have worked very well for many hundreds of years and are still used on many drums. With 50 years of drumhead technologies, Remo's Synthetic Drumheads for World Percussion instruments have proven to be a sound choice. With the help of the best percussionists in the world, Remo has improved the sound and feel of the drumheads, providing the World's Top Players the tools they need to create their music. Remo's synthetic drumheads provide easy tunability, durability, and playability. With Remo's new Crimplock Symmetry, Type 4 conga drumheads now fit more bongo drum models from the leading manufacturers in the industry.